Have you ever had something totally freaky happen to you? Something worthy of the x-files? Well…the other day Bianca and I happened to be visiting the Blue Mosque in Istanbul and there was this cat. Now Bianca can’t stay away from any animals no matter how weird, mangy, flea ridden, mental, savage they are. I always say “if it takes off your arm don’t come running to me!” but does she listen…? No! So Bianca walks up to this cat, the cat gives one yowl, climbs Bianca, tries to bite into her neck (only getting hold of my scarf) and then proceeds to salivate and knit with its paws. Now if you know cats, as I do, you know that the poor thing has probably been taken away from its mummy too young and just needs some lovin' but Bianca starts to panic for some reason…starts ranting about rabies. 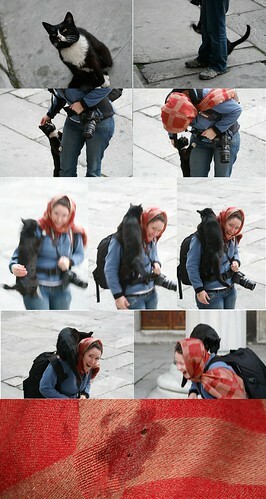 Well needless to say, after taking some pictures, I came to the cat's rescue. Bianca writes: Still keeping alert for any signs of howling at the moon, frothing at the mouth or similar rabid behaviour.